Helmet - metal helmet, medieval helmets by Steel Mastery. Welcome to section “Helmets”. 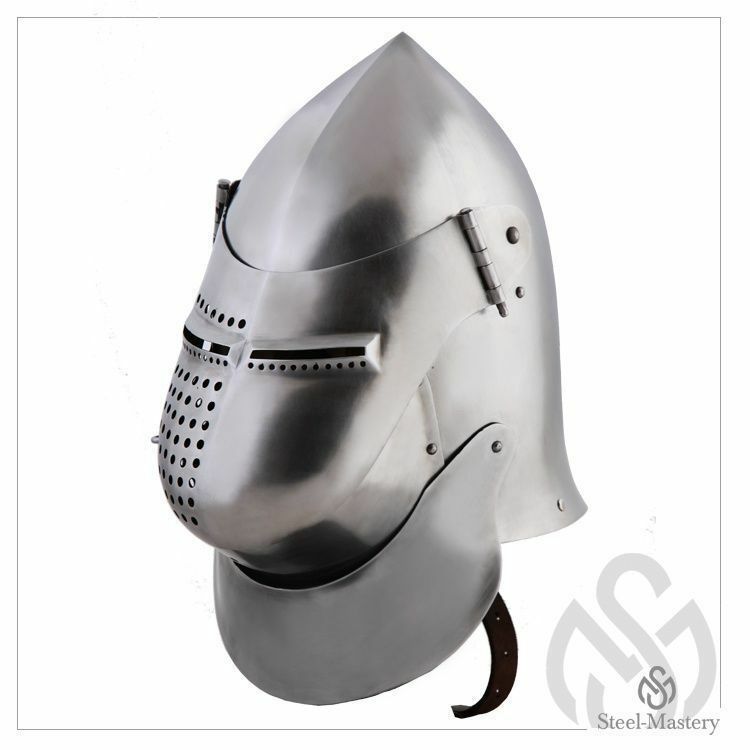 Here you can find different models of head protection, which were used by knights in medieval Europe. We manufacture helmets by individual parameters and personal regards of customer. Armour is based on the museum pieces, historical paintings and gravures. Add padded or mail aventail (if you want additional protection for neck and shoulders). If you came across any problems when ordering, please do not hesitate to contact our manager. We will help you to define your size, required model and its complement. All samples of head defense are perfect for participation in the tournaments of medieval fencing, bohurts, historical festivals and reenactment events. Depending on the complement, they are compliant to the standards and rules of such social movements, as SCA (The Society for Creative Anachronism), HEMA (Historical European Martial Arts), HMB (Historical medieval battles). Once all options are chosen, please add item to the cart and make a payment. After that, manager will contact you with measurement request and specification of order’s details. If you did not find required element of armour in this section, we can make it individually for you. Just send picture with detailed description to [email protected] , so we could quote you and discuss details of order. A kettle hat (also known as «Chapel-de-fer” and “Eisenhut”) is the simplest type of metal head protection, which looked like a hat with wide brims. Due to ease of making, helmet was so cheap, that even warriors from lower social classes were able to afford it. Chapel was made as roundish headpiece (slightly conical-shaped or bell-typed). Wide brims were lowered a bit, and sometimes had narrow eye slits. Helmet was fixed with leather chinstrap. This head protection was in use until the middle of the XVI century. Since Crusades of the XII century, European knights were wearing pot helms (another names “Topfhelm”, “The Great Helm”) during more than two centuries. Facepiece of this type of helmet had cross-shaped protrusion. It could be decorated with additional cross plates. As eye slits were rather narrow, there were additional ventilation holes on the front side. Generally, horsemen were using topfhelms, as this helmet had very limited visibility. The Great Helm suffered some changes in the early XIV century: protective face plate of harder metal had being attached to the metal conical-shaped dome. Knights usually were wearing steel cervelliere with mail aventail under the topfhelm. Such design was defending at the highest level during the lance tilting on tournaments, but not during dismounted battles. So great helms passed out of use by warriors. Bascinet (or bassinet) replaced heavy topfhelms. This type of medieval helmet had high crown of spherical or conical shape. Helmet bascinet had multifarious variant of design and provided with good protection at the same time. Helmets were distinguished by crown’s and visor’s shapes. So-called “Onion top” bascinet had pointed top and movable visor (with holes and eye-slits or grid). Starting the XV century, bascinets were equipped with klappvisor – a type of visor, which was hinged at the central part of helmets’ forehead. Some types of klappvisors had drawn pointed shape. They were called “hounskull” or “hundskugel” for similarity with dog muzzle. The more bowed type of bascinet – Grand bascinet – had appeared in Germany in the end of the XIV century. Solid plate provided with additional protection of chin and neck. Shape of klappvisor became more roundish, and big quantity of holes was designed for better vision and breathing. Salad (or sallet), semi-spherical helmet with elongated neck-flap and curved edge, replaced bascinet in the middle of the XV century. There could be reinforcement rib of the form of small comb in the middle of dome. Armourers of different European countries were inventing various kind of such helmet. German style salads had movable visor. Helmets often could be decorated with top figures, such as wings, horns, etc. These sallets had large neck-flap and become a feature element on Gothic armour. Closed helmet armet got widespread use on the South of Europe in the XV century. Back part of this head armour covered neck rather tightly, continuing its anatomical structure. Dome of spherical shape had narrow eye-slits. Bevor was a key feature of armet. It consisted of two halves, which were connected with metal pins. Visor of armet was movable. It could be raised up and fixed in such position. Italian helmet barbute was popular among dismount warriors. It had elongated cheek plates, which looked like whiskers and provided with face protection. Probably, barbute got its name because of these plates (from Italian “beard” – “barba”). Helmet had T-cut from the front. Some models looked similar to ancient helmets of the Roman hoplites. Semispherical dome had reinforcement rib, which softened the strike force up.